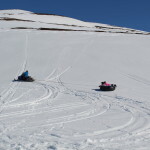 Get the ultimate adventure experience in the highlands above Akureyri. 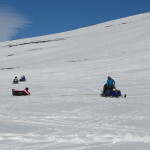 The snowmobile tour includes pickup and drop off and a use of snowmobiles, and sliding sleds. 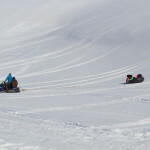 The freedom of covering all kinds of terrain on a snowmobile is something everyone should experience. 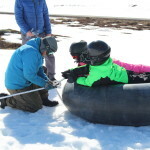 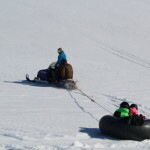 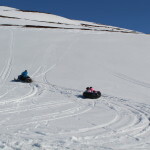 In this tour we stay in a same general mountain area where you will take turns driving on 2 snowmobiles and then we have sleds to slide on as well and we have a rope tied in the end of the snowmobiles dragging the others up hill so they can slide down. 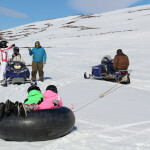 This option is made for bigger groups than 4 persons and maximum 4 persons will be able to be on a snow mobile at any time. 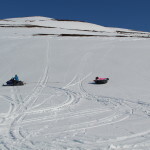 This option is designed for families and is more action packed than just an hour snowmobile ride. 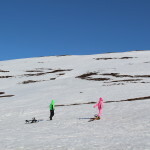 We provide you with sandwiches and hot drinks while we are up there. 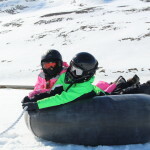 Wear warm clothing we supply helmets and gloves. 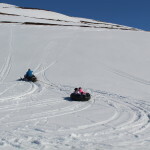 We have a scheduled tour every day at 13:00 and then we offer customized tours at any time of day.